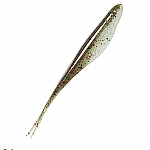 The Wally Min'R, this bait was specifically designed for one thing, catching walleye. The Wally Min'R's profile was taken from a very popular spring time jigging bait, but then altered to better suit vertical jigging for walleye. The tail was thinned a little and re-shaped a bit to give it better action, the belly area had some of the fat trimmed to allow it to "cut" through the water better at some of the deeper 30 and 40 foot depths these fish like to roam. Also we use a slightly softer plastic formula to give our baits a more realistic action in the water. The increase thickness in the head will reduce the chance of the head splitting whenn threaded onto a jig. 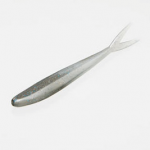 Don't discount this bait's ability to catch bone jarring smallies either, as this bait is also a very effective drop shot bait as well. 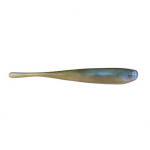 That has unmatched action for a minnow shaped bait. 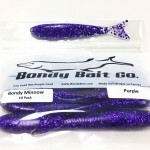 Bondy Bait Bondy Fry 3"